^ a b c d e f g h i j Donald Duren, "Lon Warneke: the Arkansas hummingbird", The Record 33 (1992). ^ a b "Census Information for Montgomery Co., Arkansas". Montgomery County ArkansasGenWeb Project. Retrieved July 23, 2011. ^ "Lon Warneke: from pitcher to umpire to judge". Rootsweb. Retrieved July 22, 2011. ^ a b c Montgomery County: Our heritage, 1 (1986). ^ a b c Lonnie Warneke, "How I got my start in baseball", Chicago Daily Tribune, May 3, 1932, as told to Irving Vaughan. ^ Jerome M. Mileur, High-flying birds: the 1942 St. Louis Cardinals, University of Missouri Press, 2009, p. 246, note 10. ^ "Cub player is injured: Warneke hit on forehead by flying bat during practice", The New York Times, February 25, 1930; Irving Vaughan, "Gabby Hartnett gives arm first test of the season", Chicago Daily Tribune, February 25, 1930, p. 19. ^ Irving Vaughan, "Cubs whip Reds, 3–2, on Barton's hit in 9th", Chicago Daily Tribune, August 6, 1931, p. 19. ^ a b See also Irving Vaughan, "Cubs unveil a musician on way west", Chicago Daily Tribune, February 15, 1932, p. 17. Vaughan quotes Warneke as saying: "I haven't been able to sell any, but I can feed 'em for a year on $35 and at that rate I can keep 'em for pets." ^ "How Warneke Got Control". The Reading Eagle. July 20, 1932. p. 10. Retrieved January 4, 2012. ^ "1932 National League Pitching Leaders". Baseball-reference.com. Retrieved January 4, 2012. ^ a b c "The 1932 CHI N Regular Season Pitching Log for Lon Warneke". Retrosheet. Retrieved July 21, 2011. ^ "Events of Tuesday, May 10, 1932". Retrosheet. Retrieved July 21, 2011. ^ a b "1932 Chicago Cubs Schedule, Box Scores and Splits". Baseball Reference. Retrieved July 21, 2011. ^ a b Irving Vaughan, "Warneke hurling only balm for Chicago Cubs, The Sporting News, August 4, 1932, p. 1. ^ "Events of Thursday, August 11, 1932". Retrosheet. Retrieved July 21, 2011. ^ "1932 World Series Game 2". Baseball Reference. Retrieved July 21, 2011. ^ "1932 World Series". Baseball Reference. Retrieved July 21, 2011. ^ "1932 World Series Game 4". Baseball Reference. Retrieved July 21, 2011. ^ "Warneke outstanding pitcher for National League in 1932", New York Times, December 29, 1932; Edward Burns, "1932 averages prove Warneke best pitcher", Chicago Daily Tribune, December 29, 1932, p. 13. ^ Patrick Mondout, "The Sporting News All-Stars", Baseball Chronology. Archived from the original on July 12, 2011. ^ John Miskell, "Lon Warneke", Montgomery County: Our heritage, 1 (1986), p. 252. ^ Al Yellon, "The Top 100 Cubs Of All Time - #50 Lon Warneke", Bleed Cubbie Blue, December 31, 2006. Archived from the original on July 21, 2011. ^ Robert Creamer, "Mudcats in the Gashouse", Sports Illustrated 6(16) (April 22, 1957), p. 28. ^ Edward Burns, "Lon Warneke's a Cub again; reports today", Chicago Daily Tribune, July 9, 1942, p. 19. Note both Duren, "Lon Warneke", p, 19 and the Chicago Tribune list the figure as $7,500, which is what the Tribune says was the "waiver price" of the day. Retrosheet and Baseball Reference (based on Retrosheet) list a figure of $75,000. ^ "Warneke passes screen tests; awaits draft call", Chicago Daily Tribune, January 6, 1944, p. 20. ^ "Lon Warneke to re-join Cubs for rest of season", Chicago Daily Tribune, June 3, 1945, p. A1. ^ "Leader Board", Baseball in Arkansas Project. Archived from the original on July 12, 2011. ^ "25th class of the Reading Baseball Hall of Fame induction details", Reading Eagle, June 19, 2011. Archived from the original on July 12, 2011.
comprising teams from nearby cities, colleges, and military facilities. He rejoined the Cubs in June 1945 but pitched in only nine games in his final season as a player. Although the Cubs won the Pennant, Warneke did not appear in the World Series. Warneke was put in charge of recreation at the Naval Ordnance Plant near  Warneke was inducted into military service on March 23, 1944, five days before he turned 35. He had previously announced that he was ready "to toss hand grenades at Hitler and Hirohito." The Cubs' World Series opponent were the Johnny Allen (17-4). The Cubs' scored 720 runs (fourth in the N.L.) and were shut out eight times. Only three Cub's batters drove in more than 65 runs: Stephenson, 85; Grimm, 80; Kiki Cuyler, 77. Both teams led their leagues in ERA: the Yankees, 3.98 and the Cubs, 3.44. Warneke's performance earned him the first start of his career, three days later, on Sunday, June 21 in the series closer against Brooklyn. With 15,000 in attendance, Warneke pitched seven innings, allowing six earned runs on nine hits and five walks, with one hit batsman. He allowed his only home run of the season to the Dodgers clean up hitter, Del Bissonette and departed the game after seven with the Cubs down 6–3. Chicago rallied for three in the top of the ninth, thus removing Warneke as the pitcher of record. The Dodgers scored one in the ninth to win the game. Warneke's second major league game was a year to the date after his first. It was also his first major league loss. This time he took the mound on the fifth day of the season, Saturday, April 18, 1931 before 30,000 at Wrigley Field, Chicago versus the visiting Cardinals. The Cubs had rallied for two runs in the ninth to tie the score 5–5 and, having used eight pitchers in the first four games of the season and another two in this game, sent Warneke out in the top of the tenth. He again showed signs of wildness, walking three of six batters faced, allowing a hit and two earned runs, and lasting two thirds of the inning before getting pulled. The Cubs could not make up the deficit and lost 7–5, with Bill ("Wild Bill") Hallahan once again recording the win—and Warneke the loss. 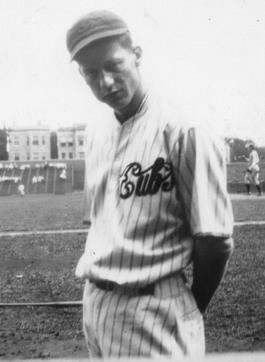 Lon Warneke appeared in one major league game for the Cubs in 1930. His major league debut was on the fourth day of the season, Friday April 18, at Sportsmans Park, St. Louis versus the Cardinals with 6000 in attendance. The twenty-one-year-old Warneke took the mound in the bottom of the sixth in relief of Guy Bush, with the Cardinals ahead 5–0. Warneke promptly doubled the Cub's deficit. He worked the sixth inning and gave up one run. In the seventh he recorded only one out and gave up another four runs before being pulled for fellow rookie Lynn Nelson. In all, Warneke faced eleven batters, walked five of them, surrendered two hits and allowed five earned runs and a wild pitch in 1 1/3 innings. The final score of the game was 11–1; the winning pitcher was Bill ("Wild Bill") Hallahan. Warneke would not pitch again in the majors until exactly one year later.